For decades I heard that phrase from politicians who came to me asking for campaign contributions, only to return year after year without results. The main priority of those politicians wasn’t serving constituents or making the changes they knew in their hearts were right. It was about getting elected and re-elected. It wasn’t about telling the truth or fighting at all costs for their beliefs. It was about saying what had to be said for the sake of serving themselves. When I began my campaign for governor, I did so with those experiences in mind. I promised the people of Pennsylvania that I would be different. I promised I would take every possible opportunity to discuss the issues in person and in public rather than hiding behind press releases or TV ads. I promised to run an authentic campaign, where voters could get a sense of who I really am and what I stand for. I promised I would not play it safe, because I firmly believe that the longstanding problems facing our commonwealth are too big to have a governor who does so. For years Harrisburg politicians have engaged in out of control spending while they let taxpayers foot the bill for their incompetence. I will move us to zero-based budgeting and bring accountability to government agencies. For years we’ve heard Harrisburg politicians, including my opponent, promise property tax relief but fail to deliver. I’ve supported a proposal to eliminate the school taxes on homes once and for all — and I’m going to get that plan across the finish line. 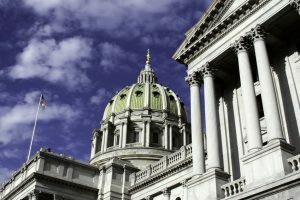 For years Harrisburg politicians have increased taxes and regulations on employers to the point where we are now the fifth worst state in the nation to start a business. I will reduce burdensome regulations, lower taxes on employers and make Pennsylvania more business friendly. I will also boost our economy by repairing our roads and bridges. I’ll move the state police funding out of the motor fuels account so those tax dollars can actually go to the infrastructure projects for which they are intended. For years Harrisburg politicians have refused to fix our pension system, which has cheated classrooms out of the resources needed for our children to receive the education they deserve. I will get more money into our classrooms by implementing true pension reform and by investing an additional $1 billion annually in students and teachers without raising taxes. And for years Harrisburg politicians have stood idle, while the opioid crisis has taken thousands of our sons and daughters. I will foster innovative treatment options through public-private partnerships, expand access to treatment, and hold those perpetuating this crisis — including pharmaceutical companies — accountable for their actions. The solutions I am proposing are bold, and they require a leader who is willing to fight for them. And throughout this campaign that’s exactly what I have done. I’ve put my agenda out there in the last year with almost 700 events, including 12 town hall meetings and six policy announcements. And while sometimes my points and positions could have been better articulated, or I’ve let my passion get the best of me, I’ve given you a chance to see what you’ll be getting. I’m not a politician. I’m a garbage man — a clean up guy — who’s trying to fix what no one else will. Governor Wolf has not done that. Governor Wolf is a politician. He has ducked debates and has refused to talk in detail about his second term agenda. He thinks he’s above fighting for the votes of hardworking Pennsylvanians. And when Governor Wolf plays it safe, it’s only safe for him. You end up footing the bill for his poor decisions — like you do because he won’t address the pension crisis or eliminate the school taxes on your home. The same way you would have footed the bill if Republicans hadn’t stood in the way of his unprecedented $4.6 billion tax hike. The Governor has played it safe on the major issues facing Pennsylvania during his first term, he’s playing it safe during his campaign, and a vote for him will be a vote for four more years of him playing it safe. But if you want something different – if you want real change – if you want to see the reforms I’ve talked about during my campaign, then vote for the risk taker on November 6th. What’s With Democrats and Capitalism?